When we want to screen a neighbor or some kind of feature from our yard or a window, we reach for the plants. 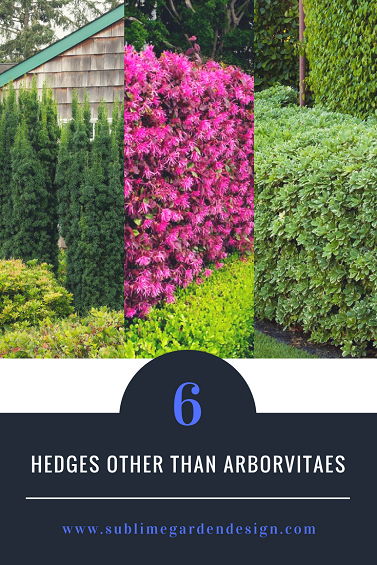 When you think of hedges, one of the first plants that come to mind for a lot of people are arborvitaes. But, while they grow fairly fast, they’re not a very long-lived shrub and can be easily damaged by the elements. 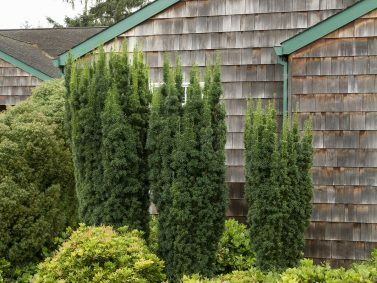 If you’re looking for different options, there are actually quite a few plants that can be used as a hedge that will hold up better than arborvitaes and provide a different look than arborvitaes. 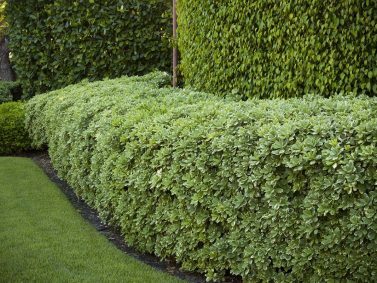 These shrubs can be sheared for a more formal look or left to their devices for a more informal hedge. Hicks Yew (Taxus x media ‘Hicksii’)- A good option for narrow spaces, this upright growing evergreen shrub has dark green foliage. Hicks Yew is also known for its bright red berry like cones. It can reach up to 10-12 feet high making it ideal for privacy screening. Plant in partial to full sun in well-drained soil away from harsh winds. Portugal Laurel (Prunus lusitanica)- Portugal Laurel (along with others such as the English Laurel and ‘Schipkaensis’) work well for privacy screens as it can handle regular pruning to maintain a specific form. It can reach up to 15 feet tall and 8 feet wide quickly and is evergreen. Sweet smelling flowers in Spring followed by berries attract birds throughout the year. Young shoots are red which contrasts nicely against the glossy, dark green mature leaves. 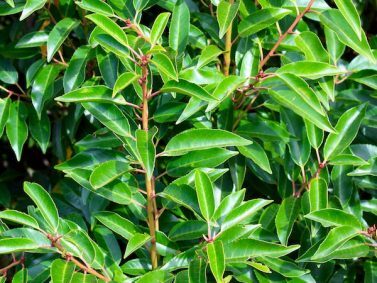 Portugal Laurel can be planted in partial to full sun and prefers well-drained soil. Fringe Flower (Loropetalum)- Ranging in color from green to burgundy to purple to red, the evergreen foliage on this shrub works well as a colorful hedge. Not only is its foliage a showstopper, in spring there are large amounts of pink to red to white flowers on each shrub. Depending on the variety of Loropetalum, foliage can start out green and turn to a brilliant orange-red in fall while some others can emerge burgundy and remain so year around. While it can be sheared occasionally, this shrub is low maintenance unless you want to prune it to your tastes. There are many different size variations making this easy to find the right one for your space. Plant in partial to full sun and water regularly especially in times of extreme heat. Viburnum- Depending on how big you want your hedge to be will help determine which kind of Viburnum you use as there are all shapes and sizes. There are also evergreen, semi-evergreen, and deciduous viburnums. Showy flowers in spring through summer can either be fragrant or mild and are followed by blue-red fruit in fall that birds love to snack on. Viburnums can be planted in partial to full sun and can be pruned as needed after they are done flowering. Sky Pencil Japanese Holly (Ilex crenata ‘Sky Pencil’)- If you have a smaller space, the narrow, columnar form of the Sky Pencil Japanese Holly may be a good option for you. Needle-like, soft foliage is dark green year around. It does best in full sun and can reach 6-8 feet tall and 2-3 feet wide. Once established it can tolerate a mild drought. Variegated Japanese Mock Orange (Pittosporum tobira ‘Variegatum’)- Variegated Japanese Mock Orange can work well as a border or hedge plant in the landscape. This evergreen shrub has a mix of white, green, and silvery-green foliage and small white flowers in spring. The flowers have a nice citrus scent. It can be sheared into shape yearly in winter if wanted. The Variegated Japanese Mock Orange does best in partial to full sun and can get to be 6-8 feet tall and wide. 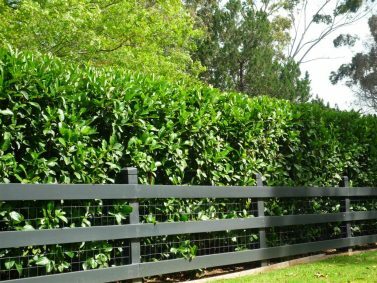 What are your go-to privacy screening hedge shrubs? Let us know in the comments, we’d love to hear from you! 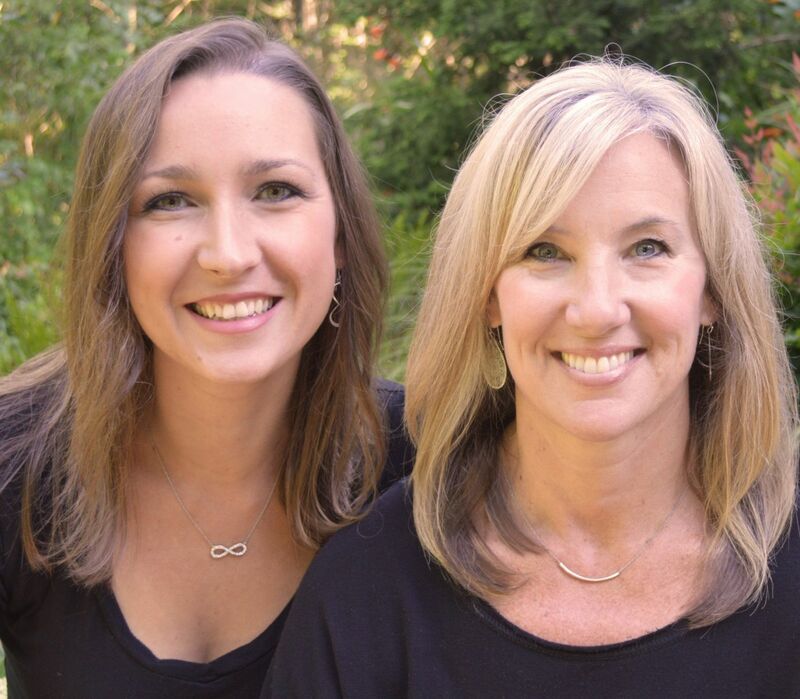 Organized under Evergreen Foliage, Foliage, Garden Maintenance, Plants I Dig, Screening, Trends. 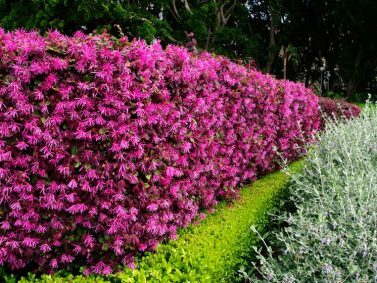 Labeled as best plants for hedges, best plants for hedges. 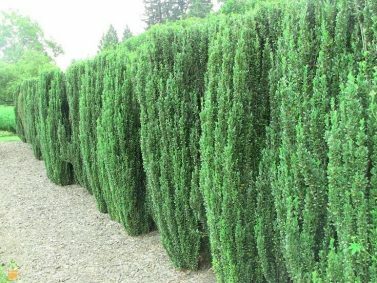 hicks yew, best shrubs for hedges, english laurel, hedge plants, hedge shrubs, hedges other than arborvitaes, hedges other than arbs, privacy screening, privacy screening plants, privacy screening shrubs, prunus laurocerasus, taxus media 'hicksii', what plants can i use for a hedge other than arborvitaes.